On April 8, 2018, First Christian Church, Longview, embarked on a new journey. Through many conversations and prayer, FCC decided to combined our two existing worship services into one. We believe that we are stronger together than we are apart. We have some exciting ways to expereince God and community. Join us as we start this new beginning. Below are some frequently asked questions. Come see why First Christian Church is a place to call home. After much discussion and prayer, FCC decided that the two worship service model was hindering our connection to one another. It was decided that both services would cease and a new style would emerge. Angel Choir is made up of children, ages 3-5. We rehearse during the Sunday School hour each Sunday using the Musikgarten "God's Children Sing" curriculum. Angels sing for worship services throughout the year. Genesis Singers is open to all children in grades 1-5. They not only sing for worship, but learn musical concepts based on an Orff/Kodaly curriculum. In addition to singing, the children learn percussion instruments such as chimes, drums, xylophones and other rhythmic instruments. Genesis Singers also present a spring musical and through their participation in church events, gain experience in worship leadership. Wednesdays at 4pm. Exodus Youth Choir is a musical ensemble for youth in grades 6-12. These youth not only sing in wotship but also perform musical pieces requiring knowledge of a variety of handbell techniques. Ringing experience is encouraged, but not required. 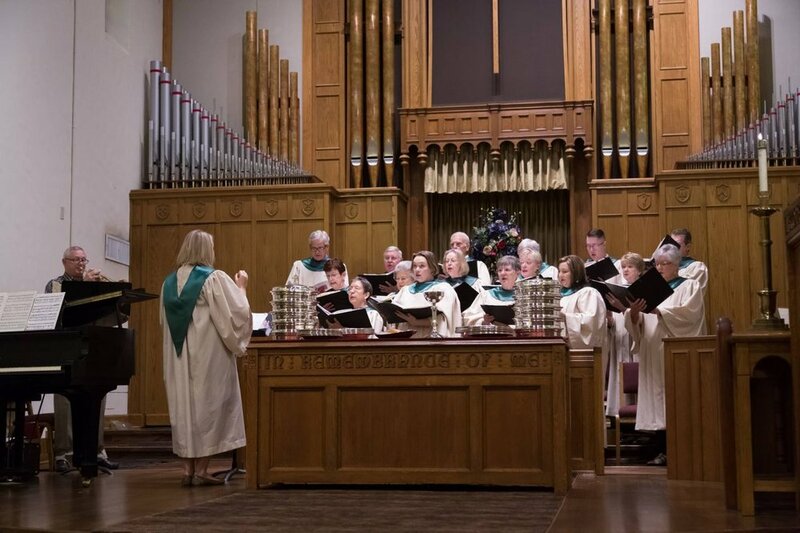 This choir presents music for worship and special concerts and meets on Sundays at 4pm. Chancel Choir is open to all singers, adult and youth. They provide service music each week and also offer special music presentations throughout the year. Rehearsals at 6:30pm each Wednesday. Chancel & Morning Bells are adult handbell choirs. They ring in worship services, accompany vocal choirs, and present concerts. Instrumental Ensembles are open to all youth and adults who play a musical instrument.